adhere Cyanoacrylate Adhesives are superior quality, high purity single part adhesives which have numerous applications in all aspects of high technology, high performance assembly. Curing at room temperature in seconds, adhere Cyanoacrylate Adhesives provide excellent bond strength on a wide range of similar and dissimilar substrates including rubber, plastics, metal, wood, leather, ceramics, ferrites, stone, cork, composites and paper. The range includes surface-insensitive, fast cure and low odour, low blooming formulations. 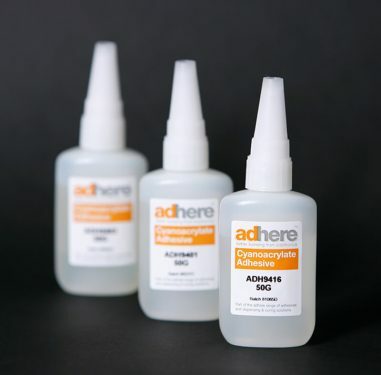 adhere Cyanoacrylate Adhesives are superior quality, high purity, single part adhesives which have numerous applications in all aspects of high technology, high performance assembly. The range includes surface-insensitive, fast cure and low odour, low blooming formulations.